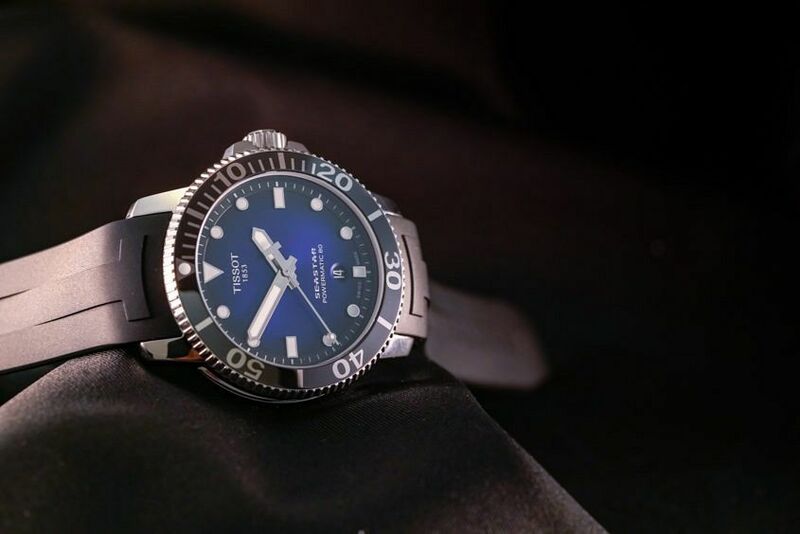 The value proposition on this Tissot Seastar 1000 Powermatic is next level. Editor’s note: Just quietly, the Tissot Seastar 1000 Powermatic is an incredible amount of watch for the money. Cool dial, modern bells and whistles, and a strong power reserve. And it looks good. This is such a great watch. Honestly. I can’t think of many (if any) Swiss-made watches that offer such a punchy package for this sort of price. Not only do you get the impressive Powermatic 80 movement (more than three days of power reserve rocks) in a good-looking, well-made 300m diver, you get nice little features like the gradient dial and ceramic bezel. So much win. On top of that, it fits great on the wrist: 43mm is big, but not obnoxiously so, especially when paired with the height. Even the dial text and date placement is done right. My only possible quibble is the strap. Not the rubber strap itself, which I quite like — Tissot ‘T’ motif and all — no, it’s the slightly odd 21mm width. Given that I’m the kind of guy who likes chopping and changing straps as often as my mood, the uncommon width is a little bit of a buzzkill. But then, for the price, it’s hard to be too harsh with this little gem.